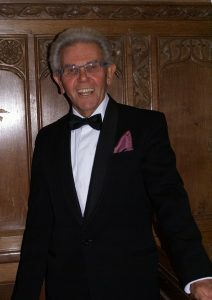 Barry is an experienced singer and teacher and is passionate about singing. It was nurtured in him from an early age when he joined the Parish Church Choir where he became Head Chorister. He went to Dartington College of Arts where he gained a wealth of choral and solo singing experience. He sang at the Aldeburgh festival with the College Chamber Choir and became a member of Exeter Cathedral Choir during his training. He began his teaching career in London where he continued his vocal training with Roy Henderson who prepared him for the teaching diplomas of the both the Royal Academy and the Royal College of Music. He performed regularly at the Grosvenor Chapel and as a member of St.Pauls Cathedral Voluntary Choir, and soon became involved with small ensembles of singers giving concerts in various venues in and around London. This was a challenging and rewarding time for him which he highly valued. He has sung a large repertoire of Oratorio and English Song, and has been a soloist for Choral Societies throughout the West Country and taken leading roles in a variety of operatic productions. Among his favourites have been “Amahl and the night visitors”, “The Marriage of Figaro”, “The Turn of the Screw ” and the role of St. Nicholas in Britten’s Cantata. He directed and took major roles in productions by the St. Austell Parish Church G and S society. Barry has a private teaching practice and also runs courses in singing for Cornwall Adult Education Service which he finds very rewarding, and has worked with several choirs on their vocal technique. He continues to study singing believing there is always something more to explore and discover, and this knowledge he shares with his students. He is a member of The Association of Teachers of Singing, the British Voice Association and the Incorporated Society of Musicians, and he continues his own professional development by attending courses, conferences and workshops which these professional bodies provide. Barry is interested in singing as a therapy, and is a great believer in the benefits singing has for all of us both spiritually and mentally as well as for our general well being and self esteem. He enjoys his work with the choir and seeks to improve their vocal performance believing that quality of sound must come before quantity….loud is not always beautiful! A choir is there to express and not to impress, and his aim for the choir is to achieve a good vocal line with clear diction and intonation, and a commitment to the text to explore and convey what the song is about.